My '90s: A Panorama of Collective Memory Televised, a project that sought to capture the quintessential look and feel of a decade of Egypt's media and, by default, the cultural substance of an entire generation, opened 1 April at the Townhouse Gallery and Rawabet Space in downtown Cairo. A generational cartography of sorts, this exhibition is composed of four parts: a documentary film by Emad Maher; a book prepared by Hassan Elhalwagy; a video installation and a live audio-visual performance by Mohamed Allam and Rami Abadir. My '90s constructs a panorama of collective memory through re-broadcasting snippets of the decade’s media to an audience that grew up inundated in it. The project is the brainchild of visual artist Mohamed Allam, who explains that the project was conceived in 2009, when he started using YouTube, like many of his friends and acquaintances, to re-watch they watched when they were younger. But for Allam, it didn’t stop at a few laughs and a pang of nostalgia. For the past four years, the artist has been collecting VHS tapes from thrift stores and Friday markets, which were predominantly taped by individuals in their homes. In a way, these were home videos for many Egyptians, who grew up watching TV religiously in the '90s, and in the several decades before then. "I think this fascination with the '90s media, which I share with my generation, goes back to our childhood in that decade, when the only source of culture, knowledge and entertainment was this little cube," Allam tells Ahram Online. To prepare for this multi-disciplinary project, Allam set out to narrow down and archive from 4000 VHS tapes he managed to gather to 200, categorising them by movies, newscasts, soap operas, music, children’s programmes and commercials. Allam did not intend for this project to be a critique of the '90s media, nor a showcase of the research he gathered over the past four years. "The project gives you the chance to re-live the media that shaped the identity of an entire generation," Allam says. The artist was adamant to weave together this wide range of materials into an original and moving art project, rather than a mere archive of '90s media. Here, he invited artists and writers to collaborate to construct a dynamic multipart work that captures the essence Egypt's '90s media. In the book innovatively designed by artist Adham Bakry to resemble a VHS tape and released at the opening, journalist Hassan Elhalwagy chronicles a number of articles, academic studies and critical pieces written about the '90s media. Meanwhile, the video installation at the Townhouse Gallery creates a visual vortex, with a number of TV sets acting as windows to the past. From football matches to soap operas to an hour-long 1999 interview with former President Hosni Mubarak, these snapshots into the past were chosen by Allam as representations or exemplars that reflect the diversity of programming during that decade. 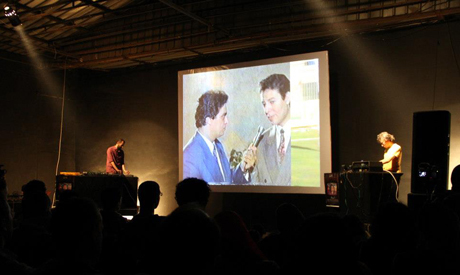 Perhaps the highlight of the project was the audiovisual live performance, in which Rami Abadir and Allam juxtaposed a stream of footage varying from the famed shot of Mubarak greeting foreign leaders to newscasts to music videos and more, drew smiles of reminiscence from the massive crowd. The performance, which was intended by Allam to be "a light, amusing and entertaining" show, stirred palpable nostalgia from the audience; people heaved with laughter and exchanged comments and memories in a vibe akin to that which emerges while watching home videos. Rami Abadir relied on '90s songs and then toyed around with them to create a faint, yet gripping soundtrack to the snapshots that took turns on the screen, organised into scenes from football matches, Mubarak’s meetings and speeches, painfully colourful music videos and more. Meanwhile, Mohamed Allam applied geometric visual effects and transitions that ensured the footage flowed with flair. The entire performance was played through analogue equipment, to keep true to that generation's media technology. Together, the transitions, footage and soundtrack transported the audience to the '90s. The final element in My '90s was the documentary film directed by Emad Maher, which was initially anti-climatic when screened after the vigorous audio-visual performance, particularly due to a video malfunction that stalled the screening for approximately 10 minutes, featured a series of media personas, including actor Khaled Abulnaga and directors Omar Anwar and Mohamed Fadel reminiscing about the form and content of programming in the '90s. Hosni Mubarak is a recurring symbol in the documentary film, video exhibition, and live performance, and the audience roared with laughter when Rami Abadir alters the toppled president’s voice during one of his lengthy TV interviews with famed presenter Mofid Fawzy, to resemble a squeaky-voiced cartoon character. Allam says that he is far from Mubarak’s biggest fan, yet his extensive research highlighted that the former president was an icon that could not be overlooked, as he was "one of the people who appeared most frequently on screen." The footage collected by Allam is indubitably grainy, evocative of these "golden days of television." The melodrama of Egyptian soaps, the blonde, styled hair of female Channel 2 presenters, Khaled Abul Naga in an ice cream commercial, Mubarak’s interviews revive a potent nostalgia on the spring evening in downtown Cairo. Though these media appear as antiquated, the '90s are far from ancient. "Although when we look at this media we feel that it is vintage, the '90s are closer than we think," says Allam. "But still, they are very different from the new millennium." In his curatorial statement, project Production Manager Peter Faris says that the '90s were the final decade to feature television playing "such a primary role in the formation of a collective memory." "Up until the end of the first millennium, television occupied a primary role in the formation of personal and individual memories through a social framework of constant interaction between members of society," writes Faris. Today, the media seems to have a vendetta against the development of a collective memory. Due to rapid technological advancements adding hundreds of satellite channels, social media networks, millions of online videos and more to the media menu, the audience is faced with a vast array of options, and television has lost its status as nucleus of attention and supreme disseminator of culture. Still, audiences are not yet entirely fragmented. If we say; "Hatooly ragel" (Bring me a man) today, most Egyptians would relate it to the Bassem Youssef episode satirising an Islamist preacher, and laugh in unison. It will be interesting to keep an eye on the construction of collective memory in the era of multiple multi-media technologies. 10 Nabrawy Street, Downtown, Cairo.